Solution provider: Microvision Inc., Bothell, Wash.
Goal:Equipped with new technologies to track enemy forces in Iraq, the Army wanted to provide Stryker commanders with the best possible situational awareness by combining digital maps and first-hand observation of the battlefield. Obstacle:Stryker commanders normally stand in their hatches so they can see what's around them. However, to look at the data generated by their new Blue Force Tracking systems, they had to duck into the vehicle, then pop back up to continue surveying the battlefield. Solution:The Army went to Microvision Inc. to buy helmet-mounted displays that generate a virtual, see-through display that lets commanders simultaneously read their computer screen and scan the horizon. Payoff:Microvision fielded 100 Nomad Helmet-Mounted Displays for Stryker Brigade commanders, who reported positive results. The company is outfitting a second brigade with up to 310 units that have been tailored to let commanders switch among three systems, including a vehicle's thermal weapons display. 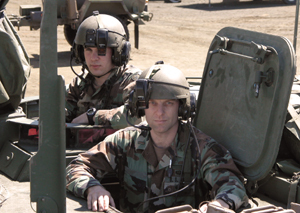 Army Stryker commanders wearing the Nomad helmet display (above) can view situational data as they survey the battlefield. If you want to know what it's like to be a commander in a brigade of Army Stryker armored vehicles, do 70 knee bends. It's not that commanders are exercise nuts, although they're undoubtedly fit. Rather, it's that cutting-edge technology sometimes leads to unintended consequences. Such was the case with the 3rd Brigade of the 2nd Infantry Division, the Army's first high-tech Stryker Brigade. During Operation Iraqi Freedom, military units were equipped with Force XXI Battle Command Brigade and Below (FBCB2) systems developed by Northrop Grumman Corp. of Los Angeles. The so-called Blue Force Tracker system provides situational awareness by showing allied and enemy positions on a digital map. Although the system was praised for its effectiveness, commanders faced an interesting challenge. They couldn't monitor the FBCB2 screens inside their vehicles and watch the battlefield at the same time. "They'd have to duck into the vehicle, check the displays and pop back out of the hatch," said Bruce Westcoat, market segment manager for aerospace and defense at Microvision Inc. of Bothell, Wash. "They said they were doing this 70 to 80 times an hour. Think about doing 70 to 80 deep knee bends an hour, then think about the vehicle doing 60 miles per hour over rough terrain." Last September, the 3rd Stryker Brigade solved this problem by adapting a wearable display system that Microvision was rolling out at automotive companies such as American Honda Motor Co.
Microvision developed a helmet-mounted device that creates a virtual, see-through computer screen in the user's line of vision. At Honda, it lets technicians view computer diagrams while looking at the vehicle they're working on. In the Stryker Brigade, the system, dubbed the Nomad Helmet-Mounted Display, lets commanders view their FBCB2 displays while surveying the battlefield. The brigade needed a display that they could use while standing out of the hatch, Westcoat said. "They wanted to look past the information at the horizon, but see the information in their field of view in case it changed." Under a $600,000 contract from the Army, Microvision provided 100 helmet displays and sent a team to Kuwait to integrate them with the brigade's FBCB2 systems. The company is negotiating with the Army to deliver up to 310 systems for the 1st Brigade of the 25th Infantry Division Stryker force, which begins shipping out this month. At the heart of Microvision's technology are a miniature light source and a micro-electromechanical systems (MEMS) mirror contained in a helmet-mounted module. The combination of the two "paints" an image of the source computer screen in front of the user's eye. "It's exactly what they would see if they were looking at the screen inside the vehicle," Westcoat said. The only difference is that the Nomad system renders the data in 32 shades of monochrome red, a color chosen for its legibility against the backdrop of the battlefield. Richard Dean, program director for wireless infrastructure and application services at Framingham, Mass., research firm IDC Corp., said there's a growing market for wearable computing devices, and integration services make up a large chunk of the market. "Each solution needs to be tailored to its individual environment," Dean said. Microvision is tailoring the Nomad devices that the 1st Brigade will use. During testing, commanders liked being able to see the Blue Force Tracking system, but also wanted to see their thermal weapons and driver displays. To address the need, Microvision created a handheld toggle that the commander could use to switch images. "If the commander has FBCB2 up in front of him, and the gunner says he has a target in his sights, the commander can click over and look at what the gunner sees," Westcoat said. Capt. Brian Vile, the 1st Brigade's assistant operations officer, said the Nomad has a major impact on a commander's ability to monitor the big picture while controlling his unit. "Although leaders must still get back in the vehicle to do higher-level functions on the FBCB2, the majority of information required while on the move is available from the Nomad," Vile said. "As it evolves, it will be an invaluable asset to the digital warrior." Microvision and Chicago-based Boeing Co. are working on the Defense Department's Virtual Cockpit Optimization program, which includes helmet-mounted displays for military helicopter pilots. In May, Microvision won a $3.9 million contract for the latest phase of the program. Westcoat said government agencies have shown "extreme interest" in Microvision's technology for use by first responders, special forces and field maintenance groups. "There's a lot of activity. Companies like Honda are reporting a 40 percent efficiency improvement," Westcoat said. "We should see the same in the military side, if not more."